I've scanned six pertinent customer reviews and present them as scans. The first Review is from James Kack, the President/Owner of Holubar during its boom years of the early 1970s. He lived and worked in Boulder, Colorado and had many dealings with three of the other major outdoor companies in town: Frostline, Camp 7/Alpine Designs, and GERRY. 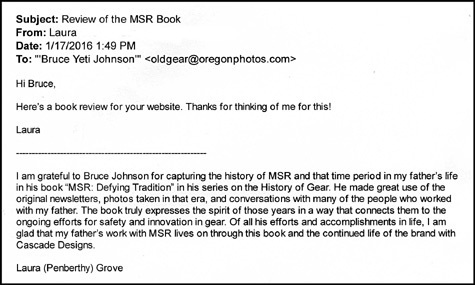 This second review is regarding my book about the history of GERRY MOUNTAINEERING EQUIPMENT CO. --- it is written by the company's founder; the reference to "Ann" is his wife. "Penny" is his daughter. Both women were very involved in the company. 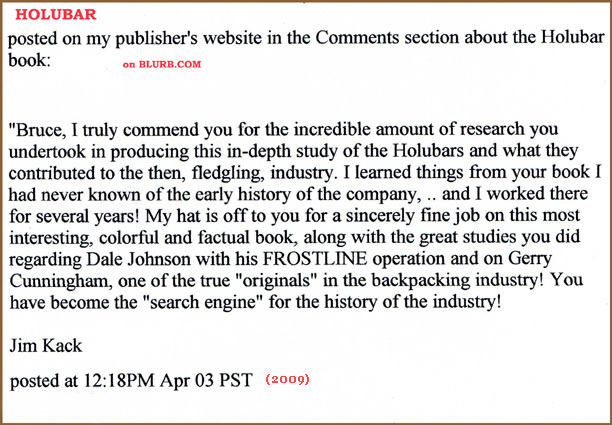 The third review is about my "Frostline Kits of Colorado" book. It's by one of Frostline's competitors in the kit business (Mr. Kack was owner of Holubar Kits (aka Carikits). Holubar and Frostline both originated in Boulder, Colorado. The fourth and fifth reviews are about "MSR: Defying Tradition." They are written by one of the two daughters of the founder of MSR, Laura, who was often one of her father's gear testers. Laura and her sister Louise gave me much help in writing the book, and once met with me at the headquarters of Cascade Designs (CDI). Here is where a MSR museum is housed. I presented the book and an MSR bike helmet to Joe McSwinney, the President of CDI. 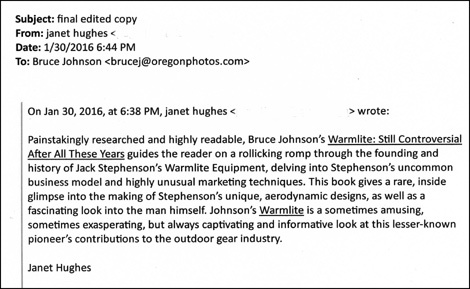 The sixth review is of my book about Stephenson's Warmlite Equipment Co. It's done by a journalist friend of mine who has very little background in outdoor gear and had never even heard of Warmlite before reading my book. THE FIVE HISTORY OF GEAR BOOKS: Books 1-4 are presented in 8x10 format with choice of hardbound or softbound and all lavishly illustrated with high-color color images. Book 5 is our bargain book, offered in a simple 6x9 inch, black&white format... Book 1: "Frostline of Colorado," updated in 2012 after Dale Johnson, its founder, passed away (Frostline). 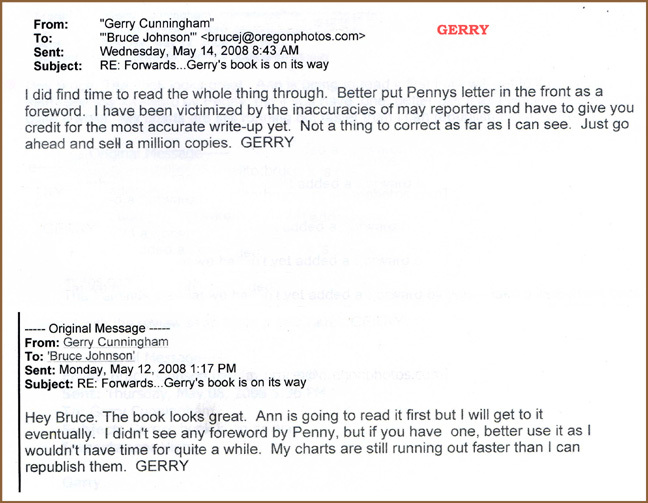 Book 2: "GERRY, To Live in the Mountains," updated in late 2010 after Mr. Cunningham passed away (GERRY). Book 3: "Holubar Mountaineering, Ltd.," rightly regarded as the inventor of the modern lightweight down sleeping bag, among other honors (Holubar). The Holubar book was lauded in 2012 as one of the year's best "Local History" books at Chautauqua in Boulder, Colorado.... Book 4: "MSR: Defying Tradition, describes Larry Penberthy's often controversial rhetoric as he took on the Climbing Establishment through his Seattle-based Mountain Safety Research company (MSR) (MSR). Book 5: "Warmlite: Still Controversial After All These Years" tells the tale of Stephenson's Warmlite Equipment, with its radically innovative products and boldly notorious nudist founder (Warmlite). All five books feature major contributions from their founders/Presidents or chief personnel. You may order the books either directly from my Publisher, or directly from me. Main Page: Essays and pictures about the Pioneers of the Outdoor Gear Revolution, 1935-The Present, 45+ pages, five books about the History of Gear, and still ever-expanding!